Your Menomonee Falls, WI Fence Company Since 1977! We have been installing fences, pergolas, and gazebos in Menomonee, WI since 1977! Call us today for a free and timely estimate. We have an A rating with Angie’s List and an A+ BBB rating. 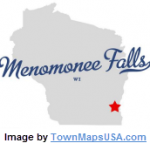 Menomonee Falls is a great place to work. At 35,626 people, it’s still small enough to be considered a village, yet vibrant enough to offer lots of things to do and places to go, from the falls themselves, to the banks of Lake Michigan, to the 400 acres of natural beauty to be found in Menomonee Park. Like other areas in Wisconsin, however, Menomonee Falls struggles with some invasive insect species that threaten many of its trees. As fence contractors, trees are a large concern of ours as well. For example, we often suggest that our customers create natural road noise barriers by planting trees and shrubs. To protect your own trees you should be aware of two threats: the gypsy moth caterpillar and the emerald ash borer. The gypsy moth caterpillar can strip the trees of entire neighborhoods of all of their leaves in a matter of weeks, stressing the trees and killing them quickly. Therefore it’s important to know what to do. Find the Waukesha County contact list for reporting gypsy moth activity here. You can get e-mail alerts about gypsy moth spray suppression here. UW Extension offers a Gypsy Moth Management Guide for Homeowners. The emerald ash borer is an invasive beetle species that kills ash trees. The emerald ash borer often comes to our attention because it can hide in wild trees that grow along old fence rows as well as in ash trees or in firewood that may be on your property. If you find an infestation of emerald ash borer beetles anywhere on your property it’s important to get help quickly. This video will teach you to identify an infected ash tree. Find a certified arborist to help with your emerald ash borer problem. Sign up for emerald ash borer e-mail alerts. Paying attention to these invasive species problems will contribute to the natural beauty of the Menomonee Falls community. The village’s concern for both beauty and safety mean that if you want to build or replace a fence on your property you will often need a building permit to do so. Menonomee Falls requires a permit for any fence that’s taller than 4.5 feet, and homes located on corner lots have to take particular care to avoid obstructing the vision of oncoming traffic with their fences. You can learn more and download a zoning permit application here. If you are interested in building a fence in Menomonee Falls, WI call us for a free estimate today! (261) 251-6766.